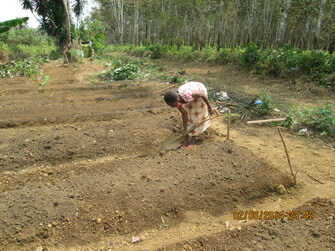 Ma Esther and her children have just been introduced to organic gardening. The children are all excited to participate. They have easy access to water with the well that Life Water dug for Provision of Hope on this property. 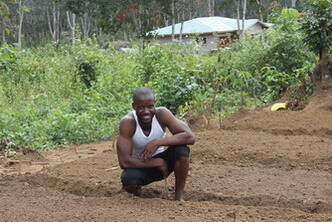 Our trainers, Kelvin and Joseph came to make the raised beds and teach them how to do this kind of gardening. Everyone at Ma Esther’s has helped to plant the seeds. 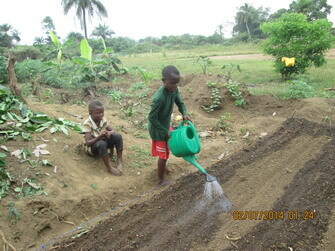 This is the dry season so they need to water the seeds daily. 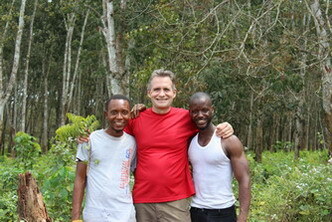 Dale Bolton, Founder of Organics 4 Orphans is standing with our Liberian Trainers, Kelvin Taweh and Joseph Sackie, who went to Kenya to attend the Organic Agricultural Training School. They are back in Liberia as trainers for Six Upcoming Projects. 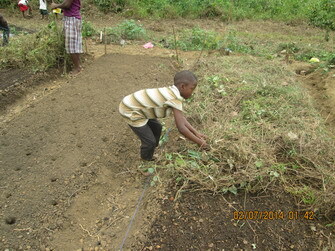 Ma Esther’s Garden is our first project. With added nutrition to their diets through Organic Gardening we are expecting the children in our homes to develop a much stronger immune system. Our goal is that the food grown will also help sustain this home. We are focusing on 4 Key Goals: Food Security, Nutritional Education, Disease Prevention, and Income Generation. Dr. Joel Fuhrman’s Nutrient Density Chart shows us the different foods, and which are higher in nutrition. 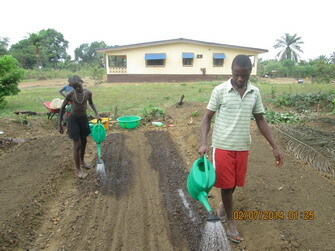 Our vision is to start Provision Gardens in many rural counties of Liberia. We will keep you posted on our progress. Each Project will have at least 10 raised beds. Our cost is approximately $500 per project. This includes all the needed Garden Tools and the transportation costs for our Trainers. « Trip Highlights	» We Bought the Land! Great to hear of the progress that is being accomplished. May The Lord bless your hard work! What amazing work that is being done in Liberia and so happy to see that Ma Esther is the first to be apart of this great project! Keep up the awesome work…I love seeing all the progress and smiles on the peoples faces, I love giving to God’s work! very inspiring! Awesome progress. Everyone looks healthy and blessed. May the LORD BLESS and KEEP ALL of you. WOW!! karen…….this is awesome. He keeps blessin an blessin you…….from a Liberian song! I love how you mine from all the best there is out there…I.e. Dr. Fuhrman!!!!! indeed your hands have found many good works to do! Hi Karren , we just love seeing God’s handi work being done . Praying for you always love WH .